This immaculate beautifully presented detached home is ideally located for local schools, shops, Bromsgrove town centre & also motorway access. The property has been much improved & thoughtfully extended by the present owners & now offers a clever blend of contemporary living whilst retaining the property�s character. This good size room measures 19�2� x 13� max & is fitted with a decorative cast horseshoe fireplace surround, coving to the ceiling, smart shutters to the front facing windows, central heating radiator, 2 centre light points & double opening French doors accessing a private decked area ideal for entertaining & summer parties. The sitting room has a cosy feel & measuring 13� x 10�11� is fitted with notable features including �bamboo� flooring, a feature cast open grate, central heating radiator, smart shutters to the window, coving to the ceiling & a built in under stairs cupboard which is fitted with a light. Situated to the rear of the property the light, bright sociable breakfast room kitchen measures 14�6� x 12�8� max & is fitted with a fine range of matching units which briefly comprise solid oak work surfaces with cupboards & drawers below, an inset �Belfast� sink, built in fridge freezer, built in dishwasher, a �Rangemaster Classic 900� dual fuel cooker with 5 ring gas hob with canopied extractor above & tiled splash back, a built in breakfast table/bar, range of matching wall cupboards incorporating display cabinets, side door leading outside, central heating radiator, velux rooflight & recessed downlighters to the ceiling. The utility room is fitted with a work surface with cupboard below together with space & plumbing suitable for an automatic washing machine, central heating radiator, double wall mounted cupboard & a wall mounted gas fired condensing combination central heating boiler. The cloakroom has a white vanity unit with inset bowl & mixer tap above, close coupled low level W.C., central heating radiator & an access to a roof space. A rising staircase from the Reception area leads to landing area. The master bedroom measures 12�11� x 10�11� & is fitted with a comprehensive range of matching built in wardrobes, cupboards, drawer units & bedside tables, central heating radiator & coving to the ceiling. Having a ceramic tiled floor the part tiled en-suite is fitted with a separate shower cubicle, white wash hand basin, low level W.C., central heating radiator & recessed downlighters to the ceiling. The second bedroom measures 10�11� x 9�4� & is fitted with a central heating radiator. Measuring 11�10� x 7�11� this lovely bright room has a dual aspect & central heating radiator. The luxuriously appointed family bathroom has a tiled floor & being partly tiled is fitted with a corner bath, twin sinks with storage below, mirrors with lighting above & built in storage units to either side, low level W.C., central heating radiator & recessed downlighters to the ceiling. To the side of the property are double opening gates giving access to a driveway with large useful area to the front of the garage which could provide additional car parking if required. 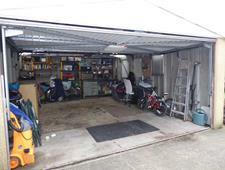 The sectional garage measures 19�6� x 14�5� (6m x 4.42 m) having a remote control up & over door, lighting & power together with a side courtesy door. The garden has been well laid out for ease of maintenance & comprises a good size secluded slightly raised decked patio area, further cobbled patio area with pathway together with an artificial grassed area having raised planted beds on three sides. The garden is privately enclosed & provides a really delightful outlook to this home. The agents understand the property to be FREEHOLD. By arrangement with the Sole Selling Agents. Offers in the region of �325,000 are invited. Purchaser's solicitors/surveyors should obtain verification. All measurements, text, plans, site areas and photographs are presented in good faith as a general guide and therefore should not be relied upon as statements or representations of fact and should not constitute part of an offer or contract. Items shown in the photographs are not necessarily included in the sale of the property. All measurements contained in these sale particulars should be assumed to be approximate and should be checked by the purchasers if of particular importance to them. Whilst we try to make our sale particulars as accurate as possible they may be subject to errors and/or omissions and therefore prospective purchasers must satisfy themselves by inspection or otherwise as to their correctness. If there are any queries of particular importance to prospective purchaser�s please contact us and we will be pleased to check the information. Buyers must check the availability of any property & make an appointment to view before embarking on any journey to see a property.